International School Bangkok (ISB) is widely recognized as one of the premier international schools in the world. Established in 1951, ISB has a proud heritage of providing quality education to expatriates from over fifty countries residing in the greater Bangkok area. The school is located in greater Bangkok within the Nichada Thani housing estate at Nonthaburi, Thailand. service. In the high school, community service is a graduation requirement; students must complete 10 hours of community service for each year that they are enrolled in high school at ISB. During our annual Global Citizenship Week over 200 students each year participate in activities such as building homes with Habitat for Humanity http://www.habitatthailand.org/, teaching English and crafts in Thai schools, and painting schools and orphanages. Students also assist with community sports programs and the monthly ThaiCraft fairs. Annual events such as the Special Kids Olympics draw up to 100 student volunteers on a Saturday morning. We are proud of the many ways in which our students make a difference in the lives of others. thrift shop; students can volunteer; donor organization! These clubs engage in direct service to our local Thai community, usually on a weekly or monthly basis. Direct service clubs develop sustainable long term partnerships with schools, NGO’s, government institutions, and other organizations which serve the local community. These clubs may raise funds to support their partner institutions or to carry out special activities, but their primary purpose is to provide direct, hands-on service to those in the partner organizations. The majority of ISB’s Community Service Clubs fall in this category. ARTfelt Panthers is designed to benefit the Thai and ISB community through making aesthetic improvements to local schools as well as engaging local youth in artistic activities. A collaborative club, ARTfelt works with other clubs to promote events within the school, such as the Special Kids Olympics, and the Spirit Tournaments. This includes making traditional and digital posters to advertise clubs or events, designing t-shirts, painting parts of the school and etc. The club is not limited to artists - it is open for anyone who wishes to help change the community for the better by making it beautiful both inside and out through art. Our schedule is flexible so even if you do not come to the weekly informational meeting, it is still possible to attend the club’s project sessions. CAS hours are awarded to IB Diploma students. No professional skills are needed, beginners who are interested are welcome. Every Wednesday, 12 children from the cerebral palsy wards at Baan Rachawadee home for mentally handicapped children come to ISB. Students take them to room 115 to draw or play with toys or for wheelchair rides around the school. At 3:30 the children return to the math quad where they are fed supper. For these children, who otherwise spend their days lying in a cot, coming to ISB is the highlight of their week. The annual trip to the beach in March, with ISB students serving as buddies, is a highlight of the year. Come make a difference in the lives of these special children. New members are always welcome! The purpose of this club is to involve the ISB community and establish a relationship with a Chinese school in Chiang Mai. Over the course of the school year, our aim is to form a stable relationship with Chiang Mai Ming De School by visiting at least twice a year to teach the students, play with them, and experience their culture. This club will offer a great opportunity for students to give back to the community directly, by interacting with the students at the school on voluntary basis or even just contributing by raising money to purchase school supplies for the students in the school. Although it is not mandatory for members to go on the trip to Chiang Mai, it is strongly encouraged because we are here to help make a difference and give back to a community who needs our support. The essence of the Elder Care Club is interaction. During our weekly club meeting, we will plan and organize many activities such as dance routines to present to the elders or prepare small acts or skits to generate entertainment. Throughout the visits to the Baan Bang Khae Nursing Home, we will strive to establish a strong relationship with the elders and to provide them with the care and the attention that they need. However, our main goal of this club is not to simply show and tell, but to carry out the small acts of genuine kindness to show them that we truly care. Habitat for Humanity is an organization made up of a group of volunteers that work together to build houses for low-income families, in this case, local Thai families. This club will be fundraising throughout the year. We will use the money to organize andsupply several Habitat builds each semester, which will directly benefit the local Thai community. This is a great opportunity for those who are interested in a hands-on community service activity. This club's purpose is to provide direct and indirect service to stroke and recovery patients at the Bang Bua Thong Hospital. We visit the hospital once a month to help with physical therapy and give Thai massage. We also raise funds to purchase equipment for the hospital. This club is for students who have a concern for the street animals of Bangkok and their place in the Thai community. The ISB Helping Paws Club has previously worked with the Soi Cats and Dogs Foundation (SCAD) by raising awareness and money during their advocacy week, and walking and washing the dogs at the shelter. Last year the club worked with Pet Animal Welfare Society (PAWS) which primarily looks at improving cat welfare. This year the club is looking to develop a relationship with Soi Dog Foundation (SDF) and continue to help improve the quality of life of street animals. Members will also have the opportunity to visit shelters and directly help these soi cats and dogs in need. There is no excuse for animal abuse - no matter meow or bark, this club will warm your heart! The Klong Toey Club is dedicated to improving the lives of the underprivileged children living in the Klong Toey slum. These children attend after-school programs at a neighborhood Klong Toey Community Center sponsored by the Church of Christ in Thailand. The Club organizes outings for these children to ISB 2-3 Saturdays a semester. Club members plan and organize a variety of both fun and educational activities including crafts, computers, sports and games – all ways to bring joy to their lives and take their education to new dimensions! If you like children and organizing fun learning activities, this is the club for you! Students in this club make a difference by teaching English to Thai students in grades 2- 6 at Wat Koo School. This elementary school in Pakkred serves children from lower income families, many of whom are migrant workers. ISB students teach English through games and other creative activities. Students leave ISB at 2:15 on Tuesdays and travel to Wat Koo School by van, returning by 4:00 p.m. On Early Dismissal days, they leave school at 1:30 and use the extra time to prepare lessons. 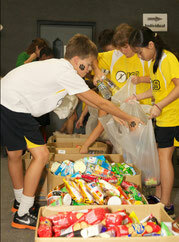 Club members also help the school in other ways by raising funds for school improvements. If you like soccer and children, this is the club for you! Every other Sunday morning, starting in September, a group of about 20 orphan boys from the Maharaj Boys Home come to ISB to play soccer and other games with their ISB friends. The boys love the chance to play using our facilities and to interact with their “older brothers and sisters” from ISB. Language is not a barrier! Phayathai Babies’ Home is a government-run orphanage for children from birth to five years old. ISB Students spend valuable time with the young children giving them individual attention and stimulation by holding, playing with and feeding the babies. They may also organize activities for the older babies. Students need a Community Service Club Permission Form signed by a parent before their first visit to the Home. A bus leaves in front of the school at 2:15 every Friday and returns at 4:15 so students can take the 4:30 bus home. Rainbow House is a residence in Pakkret for children with disabilities. The RH club organizes 2-3 Saturday morning visits to ISB per semester; we have used many school facilities e.g. library, pool, artroom, playground and field. Members have also been involved in different fund-raising initiatives. Last year, after a visit to Rainbow House, we raised money to contribute to a new playground. Our club focuses on providing music performance, education and therapy to Thai children. We will periodically join with other service clubs to serve them with music. This is a good opportunity for you to improve your music skills. You don’t need any prior studying of music to join this club. RDA is a community service club which assists physically challenged Thai children to ride ponies at the Nonthaburi Equestrian Sports Club. Horseback riding is well known to be therapeutic for disabled persons. Members of this club help the children approach, mount and ride the ponies. This involves walking on the ground beside the children/ponies for support, encouraging the children and ensuring their safety. Students earn 1.5 service hours for each session in which they participate. Transportation is provided, and leaves the front of ISB at 2:15 pm every Friday. The club needs a lot of help, so please consider taking part in this great community service activity! Students must wear cool clothes and running shoes and bring a Community Service Club Permission Form signed by a parent before their first visit. The Rural Development Club’s purpose is to help poor people in rural Thailand in a sustainable manner. We have been supporting the Sum Sung community in Khon Kaen for the past two years by helping them market their organic, chemical free vegetables and assisting them with other projects to benefit their community. By helping them to market and sell their produce, we have helped to eliminate the middleman so that the rural community can receive 100% of the profits. This in terms allows for this rural community to prosper under the basic principles of self-sustainability. Imagine if you can’t see anything for only one hour and you have to live your life in the dark…How would you manage your life with sight loss? Life will be truly more difficult. In the past, 90% of the blind in Thailand did not have a chance to go to school. No more than a hundred could reach their academic potential in higher education. There were not many blind people who had their own career and could earn their own income. Nowadays, the socio-economic situation of the blind in Thailand has changed. The blind have more opportunity in Thai society. However, they still need help from us. Joining School for the Blind club and making visits to the school, you can make a difference. ISB students participating in the Sparrow Home Community Service Club will have the opportunity to make a difference in the lives of a group of young children being cared for at Sparrow Home while the children's mothers are serving time in Thai jails. ISB students develop friendships with these children through regular visits where they have the chance to play with and take care of the children at Sparrow Home (and at the ISB campus during some Thai school holidays). The children range in age from around one to six years old. Club officers and members will be expected to arrange activities and snacks for the children on each Friday visit, as well as organize fundraising activities throughout the year. ISB students earn an hour and a half (1.5) of community service credit for the Friday visits; officers earn an extra half hour (0.5) per scheduled meeting. The first time students go to Sparrow Home they must have completed and turned in the Community Service Club Parent Permission Form to travel off campus. Montri vans, marked “Sparrow Home,” leave ISB from in front of the Business Office and travel to and from Sparrow Home in Moobaan Prachachuen, off Samakee Road, and return to ISB in time for the Friday late bus at 4:30 pm. The Pakkret Reception Home for Boys, a.k.a. The Street Boys Home, is a child welfare institution which provides temporary protective services for needy boys aged 7 to 18 who are orphaned, abandoned, and/or homeless and who remain at the home for no more than six months. On Thursday afternoons, about 20 boys between the ages of 6 and 10 come to ISB for a variety of fun and educational activities including arts and crafts, sports, swimming, or just plain silly game playing. Club members plan and carry out the activities and serve the children snacks before they return to the Home – always with a smile on their faces! Thai Craft Club promotes the concept of Fair Trade, which is the trading of goods that creates relationships between producers, traders and consumers in a manner that ensures that producers work in safe conditions, are paid fair wages, and are mindful of the environment. Club activities include working at the Thai Craft Fair Trade Organization’s sales at Jasmine City Building, Bumrungrad Hospital, and ISB throughout the school year and the dissemination of information concerning Fair Trade on the ISB campus. As helpers during the sale time, ISB students engage in a number of fun activities. Bring friends, as the club needs as much help as it can get! Do you remember the Asian Tsunami of 2004? Join the Tsunami Relief Club and show that you still care! This club supports children who lost their homes and families to the tsunami. Our goal is to build friendships with these students and continue the strong relationship between ISB and 35th Rajaprajanugroh School in Khao Lak. We hold exciting fundraisers and organize trips to and from the R-35 school, including hosting an exchange in October and a Friendship Weekend in January down in Khao Lak. Volunteers are always needed! The Wishing Tree Club is an all year community service club that focuses on giving backpacks to poor children in remote regions of Thailand. We have been active for over ten years, and each year, we choose an institution to work with. In December, we set up Christmas trees for people in the ISB community to fill bags with personalized toys, basic supplies, and school materials that we will later deliver to the children. In the second semester, we partake in fundraising activities. The children that we help are in dire need of support, and have very few possessions. The Wishing Tree Club strives to make a difference in their lives, backpack by backpack. The purpose of these clubs is primarily to raise funds for a particular organization or charity - either local or in another country. At least 2/3 of these clubs support organizations or charities in Thailand. For those which are outside of Thailand, a strong link with ISB is preferred - e.g. an organization/ charity which ISB visits during GCW. As with the direct service clubs the goal is to develop and maintain a sustainable partnership with these organizations. The Bangkok Cancer Support (BCS) Club promotes awareness about cancer and raises funds to support research, support and reach out programs. This community service club will assist underprivileged Thais get the necessary medical care. Each year the club helps promote the annual Bangkok Cancer Care Run. The Book by Book Club’s aim is to help Thai Primary schools restore their libraries that were damaged during the floods last year. This community service club focuses on fundraising in order to purchase books for flood damaged schools. Activities include monthly book sales at the Nichada Market and other fundraisers to support our goal. Last year we raised funds to donate over 3,500 books to local schools. Join us to make a difference in the lives of Thai primary students! If you are interested in finance, philanthropy or both, this is the club for you! The ISB Service Fund, funded by a generous grant from the ISB PTA, exists to make grants and loans to student run community service clubs (ES, MS and HS) for their service projects. The Fund managers will set up criteria for distributing funds, evaluate applications and interview applicants, disburse the money, and follow up to see that funds have been successfully used. The Fund managers will also be responsible for overseeing replenishment of the Service Fund so that it is sustainable. The club raises funds and awareness for surgery of children with cleft lips, cleft palates and facial deformities through local and international initiatives. The club will expand kids action for kids’ model of developing synergy between international students’ home country and host country, to raise funds. Launching Academic Tuition In Northern Thailand (L.A.T.I.N.) In the rural parts of Thailand, it is especially hard for young girls to afford to go to high school. Latin club raises funds for young women’s education in Chiang Rai (Northern Thailand). Our main goal is to support as many girls as we can so that we can make sure that they will be able to secure a job in the future and provide financial support for their families. This club is the oldest club in ISB, and has been supporting girls’ education for more than 50 years, and counting! Operation Smile provides medical care to young adults and children with facial deformities. The organization was founded in 1982, and has ever since expanded to all corners of the world. The club will raise funds in order to support missions in our host country, Thailand. Additionally, the club will attempt to educate the ISB community about Operation Smile and support the Thailand chapter by participating in a variety of services. Come join and us in helping kids smile for life!!! Shining Hope for Communities combats gender inequality and extreme poverty in the Kibera slum of Nairobi, Kenya, by linking tuition free schools for girls to accessible social services for all. We bring hope to women because through women, we bring hope to entire communities. These clubs promote awareness of and campaign for the solution to global issues, including the environment, human rights, poverty, global health, and other humanitarian issues. These clubs may periodically engage in fundraising to support a particular cause, but their main function is to promote awareness about global issues and the means to solve them. The focus of the advocacy may change from year to year. While there are a few advocacy clubs with a specific focus, students who have an interest in a particular cause are encouraged to join one of the three “umbrella” advocacy clubs: Amnesty, GIN, and Green Panthers. Amnesty International is a human rights organization with over a million members from around the world. The ISB chapter works closely with AI-Thailand to ensure members become informed about the organization, human rights legislation and specific cases of human rights abuses around the world. Activities of the club include sending appeals to appropriate authorities regarding human rights abuses, presenting information on human rights and the AI mandate, campaigning for human rights issues, listening to guest speakers, taking field trips and celebrating our hard work and achievements. ISB student participating in GSA will have the opportunity to effect social change by increasing awareness about the negative effects of homophobia and create a comfortable environment for all sexual orientations. We plan to reduce verbal slurs and encourage open dialogue through our various campaigns. We want to dispel any false perceptions about homosexuality and make our society a tolerant place for all. World poverty, AIDS, refugees, peace, water management …. If these are some of the issues that you are concerned about, then this is the club for you! This club aims to promote general awareness of global issues among the student body through assembly presentations and advocacy weeks, as well as to take action to make a difference - whether it be in the local community or on a global scale. GIN club members collaborate and network with other advocacy and service clubs at ISB as well as with other Bangkok schools. The GIN club is always ready to welcome new members! The Green Panthers’ goal is to spread awareness of global warming and other environmental problems and to take action to reduce ISB’s carbon footprint and make ISB a green school. Activities include organizing recycling drives, tree planting to offset carbon emissions from GCW and IASAS exchanges, designing and selling water bottles and other eco products, and promoting Earth Hour and Earth Week. A subgroup of the Green Panthers also raises awareness about animal rights and endangered species. If you are passionate about the environment and want hands on involvement, then this club is for you! The Green Panthers has a sub-club that will partner with the Elephant Nature Park in Chiang Mai. Our goal is to raise awareness, and possibly funds for the park.